Description This dataset contains the Version 2.1 CYGNSS Level 2 Science Data Record which provides the time-tagged and geolocated average wind speed (m/s) and mean square slope (MSS) with 25x25 kilometer resolution from the Delay Doppler Mapping Instrument aboard the CYGNSS satellite constellation. This version supersedes Version 2.0. The reported sample locations are determined by the specular points corresponding to the Delay Doppler Maps (DDMs). A subset of DDM data used in the direct processing of the average wind speed and MSS is co-located inside of the Level 2 data files. Only one netCDF data file is produced each day (each file containing data from up to 8 unique CYGNSS spacecraft) with a latency of approximately 6 days (or better) from the last recorded measurement time. The Version 2.1 release represents the second science-quality release. 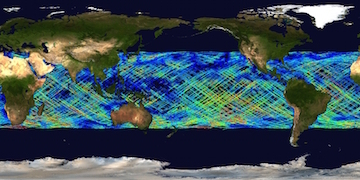 Here is a summary of improvements that reflect the quality of the Version 2.1 data release: 1) revised Geophysical Model Functions (GMFs) for both Fully Developed Seas (FDS) and Young Seas with Limited Fetch conditions, to be consistent with the calibration changes made to the v2.1 Level 1 science data products. ; 2) Revised covariance matrix between DDMA and LES versions of the FDS wind speed retrieval, used by the minimum variance estimator, resulting from changes made to the v2.1 Level 1 science data products; 3) Revised debiasing algorithm coefficients used by the FDS L2 retrieval algorithm, resulting from changes made to the v2.1 Level 2 science data products; 4) revised quality control (Q/C) flags related to the required level of consistency between DDMA and LES versions of the FDS wind speed retrieval (the errors in the two retrievals are now less correlated so larger discrepancies are allowed; if either retrieval is not available, the sample receives a fatal Q/C flag); 5) new Q/C flag related to the block type of the GPS satellite which provided the transmitted signal. Samples using block II-F signals receive a fatal Q/C flag due to the higher level of uncertainty in their radiated power; 6) revised wind speed uncertainty values as a function of RCG and wind speed, plus a new dependence of the uncertainty on GPS block type to reflect the higher uncertainty in GPS radiated power for block II-F satellites. Level 2 Mean-Square Slope Retrieval Algorithm Theoretical Basis Document, V. Zavorotny, CYGNSS Project Document 148-0139, Rev 3, 22 September 2016. Level 2 Wind Speed Retrieval Algorithm Theoretical Basis Document, M. P. Clarizia, V. Zavarotny, C. Ruf, CYGNSS Project Document 148-0138, Rev 5, 17 Aug. 2018. Ruf, C., R. Balasubramaniam, 'Development of the CYGNSS Geophysical Model Function for Wind Speed', IEEE J. Sel. Topics Appl. Earth Obs. Remote Sens., doi: 10.1109/JSTARS.2018.2833075, 2018. Clarizia, M. P., and C. S. Ruf, 'Wind Speed Retrieval Algorithm for the Cyclone Global Navigation Satellite System (CYGNSS) Mission', IEEE Trans Geosci. Remote Sens., doi:10.1109/TGRS.2016.2541343, 2016. Citation CYGNSS. 2018. CYGNSS Level 2 Science Data Record Version 2.1. Ver. 2.1. PO.DAAC,	CA,	USA. Dataset accessed [YYYY-MM-DD] at http://dx.doi.org/10.5067/CYGNS-L2X21. Journal Reference Ruf, C., S. Gleason, D. S. McKague, 'Assessment of CYGNSS Wind Speed Retrieval Uncertainty', IEEE J. Sel. Topics Appl. Earth Obs. Remote Sens., doi: 10.1109/JSTARS.2018.2825948, 2018.